Department of Oral Medicine and Radiology, Indira Gandhi Institute of Dental Sciences (IGIDS), Sri Balaji Vidyapeeth (SBV), organized CORE 2018 at Conference hall, IGIDS, on 31st October 2018 from 9.00 AM to 4.00 PM. The program commenced with the college anthem. Prof Jagat Reddy, Head of the Department, Department of Oral Medicine and Radiology, IGIDS, delivered the welcome address. Prof Saravana Kumar, Principal, IGIDS, felicitated the gathering. Prof Aravind, Academic Head, Department of Oral Medicine and Radiology, Saveetha Dental College, Chennai, delivered an informative lecture on ‘Role of CBCT in implantology – An overview’ which gave an insight on the basics of CBCT, vital anatomical structure considerations before implant placement and reporting a CBCT. 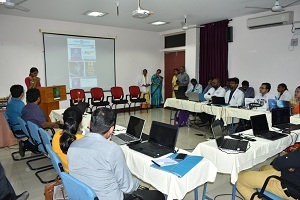 The lecture spanned over an hour subsequent to which the hands on work shop on data manipulation of a 3D-CBCT commenced .The work shop dealt with an introduction to the care stream software and its tools, nerve tracings, measurements and virtual implant placement with 3D Volume rendering of the image .The program also experienced constructive discussion during the work shop. The 20 participants were both from in house and from colleges in the neighbouring states. The program bid adieu by 4.00 PM as scheduled with certificate distribution and national anthem.